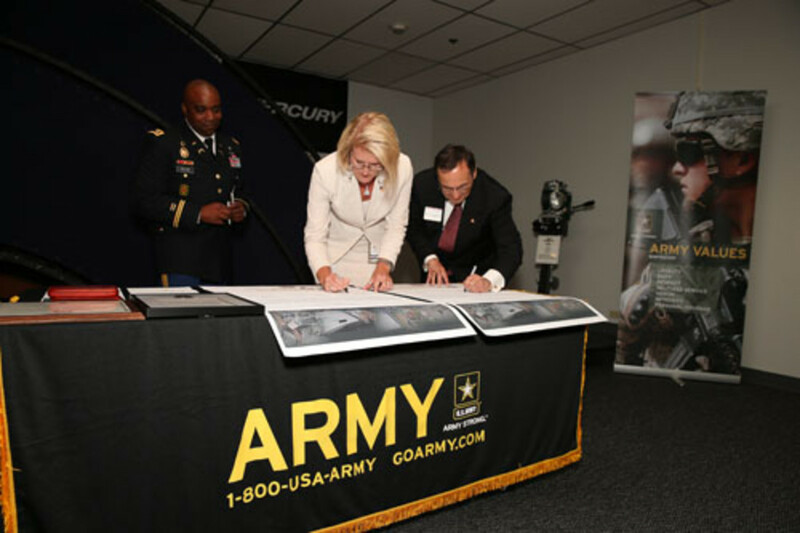 Mercury Marine and the Army Recruiting Command signed an agreement Wednesday to provide priority interview status to qualified soldiers participating in the Army’s Partnership for Youth Success program. The ceremony took place at Mercury Marine’s headquarters in Fond du Lac, Wis.
Mercury vice president of human resources Denise Devereaux was joined by ret. Maj. Gen. Paul Lima, civilian aide to the secretary of the Army for Wisconsin, and Lt. Col. Daryl Collins, commander of Army Recruiting Battalion Milwaukee, to sign a ceremonial memorandum of agreement. After soldiers enlist in the Army, they are provided an opportunity to link with a PaYS partner, such as Mercury Marine, that will reserve future interview opportunities that relate to the soldier’s military occupational specialty. More than 150 veterans are employed by Mercury Marine in Fond du Lac. Coinciding with the PaYS agreement-signing ceremony, Mercury announced the formation of a Veteran Employees Network, which will allow veterans an increased opportunity to communicate with and support each other while transitioning to a life beyond the military. It also will serve the veteran community through participation in community service events.